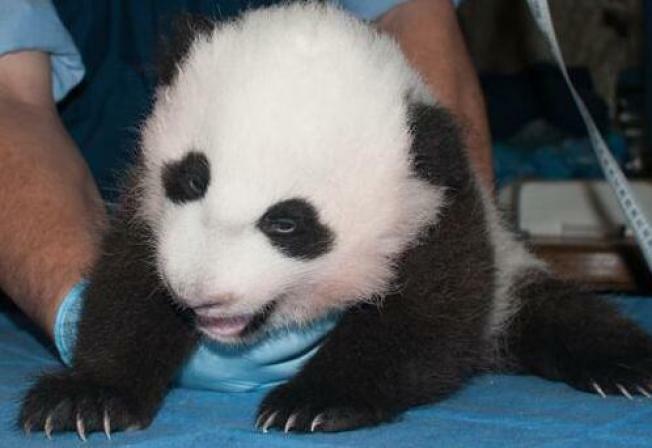 The National Zoo’s two-month-old panda cub is starting to spend some time away from protective mom, Mei Xiang. Most recently, the still-unnamed cub weighed in at a healthy 7.7 pounds, and her eyes, which began opening earlier this month during the government shutdown, have nearly opened all the way. Mei Xiang is now being sent outside for breakfast for up to two hours per day, leaving the cub to nap and be examined by veterinarians. She now measures at 23 inches; her right front paw is 2.4 inches long and her hind paws are 3 inches long. The cub is expected to start walking in approximately two months, and will not be on display to visitors until she's older. To hold you over, watch the cub on the National Zoo's Panda Cam. Some dedicated Panda Cam watchers have expressed concern the cub could get its head stuck between bars in her den -- zoo officials say they have determined the cub's head is larger than the space between the bars.